The new research building will pull out the stops to cut energy use: chilled beams, fewer air changes, and gel packs that cool the building. 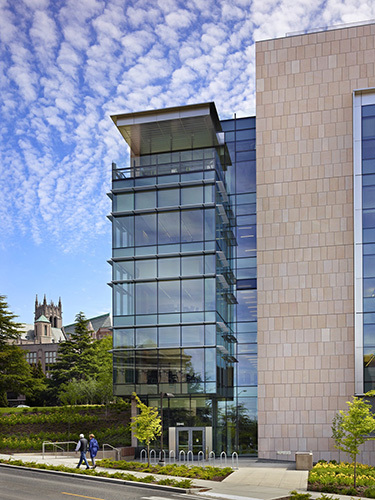 The 78,000-square-foot Nanoengineering & Sciences Building is the second phase of a 168,000-square-foot complex at the center of the University of Washington campus. The first phase was the 90,000-square-foot Molecular Engineering & Sciences Building, completed in 2012. The two-phase project accommodates growth in the molecular engineering and nanoengineering fields, responds to the evolving interdisciplinary nature of teaching and research, and fits within a historic, high-density area of the campus. The Nanoengineering & Sciences building will be specifically equipped for the performance of organic, inorganic and biomolecular synthesis, and will accommodate students and faculty in a variety of nanoengineering disciplines. Sited in the science and engineering core of campus, the complex occupies a highly visible location on Grant Lane, and shares a courtyard completed as part of the Molecular Engineering & Sciences project. The buildings help to form and enhance outdoor public space and extend pedestrian pathways, aiding in wayfinding and connections to other parts of the campus and the surrounding community. Additionally, its proximity to other science and engineering buildings allows for cross-departmental pollination and joint research opportunities. The 90,000-square-foot Molecular Engineering & Sciences Building was completed in 2012.